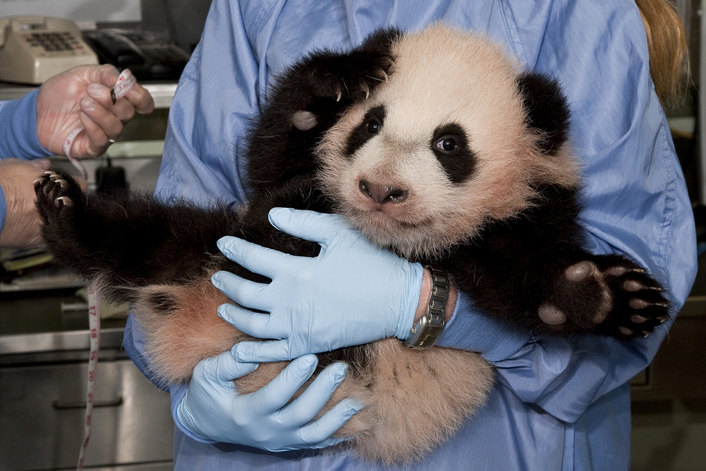 The San Diego Zoo has released footage of five month old panda bear Yun Zi. Panda lovers have been following the panda’s progress on the San Diego Zoo Panda Cam. Currently 239 Giant Pandas live in captivity inside China and another 27 live outside the country. Anywhere from 1,500 to 3,000 live in the wild. Every panda birth is certainly a cause for celebration! * If your family loves pandas, why not adopt a panda from one of the following organizations? * Most of the above-mentioned organizations, and zoos that have pandas such as the San Diego Zoo, sell panda toys and items. * Create a panda cake for your child using the following instructions. A two layer cake could be used and less icing applied, if you prefer. * Purchase a book about pandas online. New and used/gently used books provide a variety of price points for purchase. J. Muth’s books are about a kindhearted panda bear name Stillwater. Panda Watch Me Grow – DK Publishing: An introduction to the life cycle o the panda bear for young readers. See excerpts inside the book.